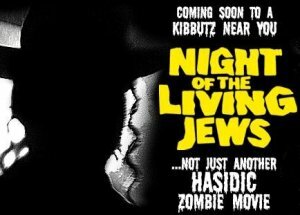 Night of the Living Jews at 2 festivals and DVD release soon! Hey hey folks.. we reviewed this one WAY back, like a really long time ago and also did an interview with the director, who incidentally just emailed to let us know that his awesome short film, NIGHT OF THE LIVING JEWS, will be playing at 2 upcoming festivals. The first is "A Night of Horror Film Festival" from April 3-11 in Sydney, and the second is at the "Toronto Jewish Film Festival" running from May 3-11. There will also be more festival announcements and a DVD release coming soon, so check out the trailer and links all after the break, and we'll have more news soon. "On the first night of Passover the residents of a remote Jewish bungalow colony are turned into flesh eating zombies by matzoh with a dark history. In the hunt for human flesh, the zombies descend on an unsuspecting family in their quiet farmhouse. The loving mother (Alexandra Angeloch), father (Phillip Levine), along with their rascally son James (Adam Forrest) and naively seductive teenage daughter Sally (Sierra DeCrosta), have to tap into their deepest survival instincts to battle Hasidic zombies, killer payos (thatâ€™s right, those little curly side-burns), and antler-sporting zombie rabbis. Itâ€™s really the beginning of the end when a fairly tall but not so dark stranger (Nate Earl), who knows the situation all too well, miraculously appears. Journey through their hellish night of terror, romance, and a frighteningly non-kosher diet."